Seamlessly merging classic elements with modern trends, the Olsberg 3-piece sectional invites you to bring home the best of then and now. 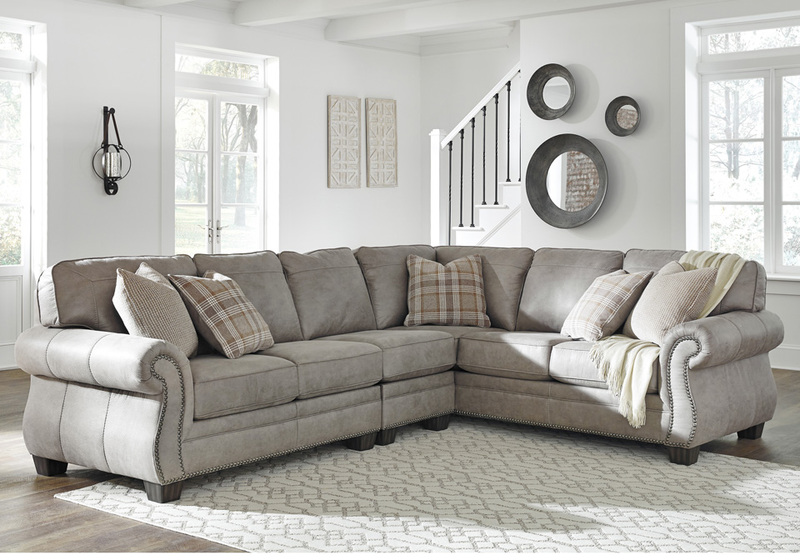 Wrapped in a fabulous steel gray upholstery with sumptuous suede-like feel, this easy-elegant sectional is dressed to impress with updated roll arm styling and tailored touches including nailhead trim and window pane stitching. What you can’t see is every bit as impressive. Reversible seat cushions crafted with our highest quality coils provide a bit of bounce and plenty of comfort and support. Frame constructions have been rigorously tested to simulate the home and transportation environments for improved durability. Components are secured with combinations of glue, blocks, interlocking panels and staples. Seats and back spring rails are cut from mixed hardwood and engineered lumber. Stripes and patterns are match cut. All fabrics are pre-approved for wearability and durability against AHFA standards. Cushions are constructed of low melt fiber wrapped over foam. Style features Jumbo Stitching.